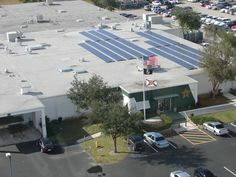 I thought April 15 would be a great day to talk about the tax benefits of solar electricity. However, I’m not really going to talk about the massive 30% tax credit you can take on a solar electric (solar photovoltaic or PV) system. I want to talk about the tax implications of the stream of income that follows an investment in solar energy. The return you get on a solar energy investment isn’t usually dollars back in your pocket or bank account in the traditional sense of investing. Your return is the reduced electricity bills you will see for the next 40 years (yes, solar energy systems will still produce energy well after their 25 year warranties!) The beauty of this return on investment is that it comes tax-free! Right now you are paying your electricity bill with after-tax income. If you want to compare the solar investment return with other investment alternatives, you have to consider the taxes you would pay on those alternatives. For example, let’s say you have the choice to invest some amount of money that will reduce your electric bill by $1,000 in the first year and you are comparing this to a stock investment of the same amount that you expect to provide capital gains in one year. 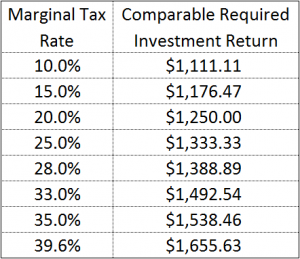 At 15% capital gains tax, your stock investment would have to return $1,176.47 to be equivalent. If you are lucky enough to be in the new 20% capital gains bracket, the comparable stock investment would need to return $1,250.00. 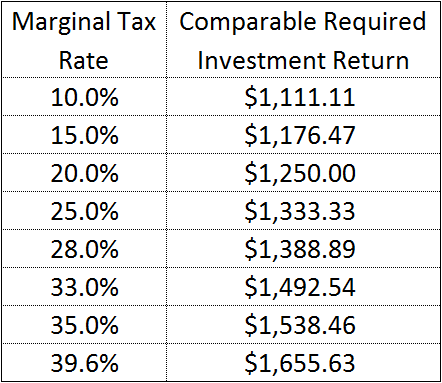 If you are comparing a solar investment to an alternative investment that will be taxed at your regular marginal income tax rate, the comparable investment return may need to be even higher – $1,655.63 if you are in the new 39.6% income tax bracket! Note: There is a new medicare tax on investment income that is ignored from these examples, making solar even more attractive in relation. Another way to look at this is to figure out how much more you would have to invest in an alternative to get the same after-tax return as solar energy. Using the top tax bracket as an example, you would have to invest 65.6% more to get the same after-tax return in dollar terms! This is just the tip of the iceberg. As time goes on, solar electricity will presumably offset a larger dollar amount on your electricity bill as electricity rates increase. Therefore, your comparable investment return would need to continue to grow to keep pace. Also, presumably your income will continue to increase, putting you into higher tax brackets, further increasing the required comparable investment return. Finally, most American’s believe that today’s tax rates are not likely to remain as low as they are. There are very few tax-free investment alternatives out there. Traditional tax-free investments like municipal bonds often provide paltry returns or significant risk (many states and municipalities are in financial trouble). Solar electricity is a tax-free investment that is very low risk and just gets better as inflation and higher taxes take hold. 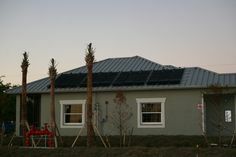 Did I mention that you get a 30% tax credit in the tax year in which you install a solar electric system? 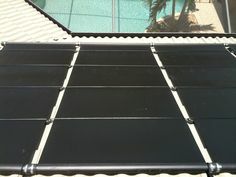 Next Post: What type of battery does the Pentair SunTouch Use?